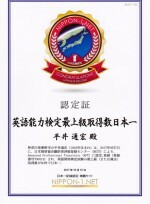 Certified as a Japanese record by Nippon-1 Net (日本一ネット). 11 Travel English Standard Test (ＴＥＳＴ) A Jun 1994 JTB Education & Culture Systems, Inc.
*1. Currently, not administered anymore, or the organization does not exist anymore.